Here is a prayer to the Cherubim and Seraphim, and the great beings that help with the the plane of forces through which the Cosmos manifests. We so seldom think of them, is it not so? And yet, they protect and nourish all Creation. Through Christ Jesus, my Lord. The beautiful instrumental music in the video is “Prelude No. 16” from the album “Preludes” by Chris Zabriskie, CC BY 4.0 … https://creativecommons.org/licenses/by/4.0/ .. 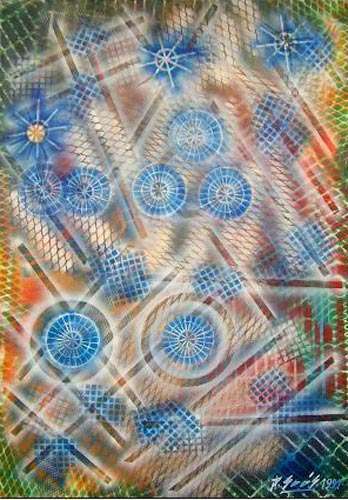 Image: Seraphim, by Joska Soos, http://www.soul-guidance.com/houseofthesun/media/jsimages/ent07.jpg ..
Link: “Light-Sound Beings,” paintings by the the Hungarian shaman Joska Soos, http://www.soul-guidance.com/houseofthesun/soosentities.htm ..
Link: “The House of the Sun,” by Dirk Gillabel, http://www.soul-guidance.com/houseofthesun/devas.htm ..
Potentates. I feel that the Potentates are those that control the Dark Forces. Angels. It is noted in the above link that the Angels have been protecting God’s holiness from man after the Fall. In my world view, the Fall mentioned in the Bible is but one of the Great Ages of Darkness through which our far-flung Solar System provides the much sought-after duality training for those Souls seeking the path of accelerated Soul evolution. It is noted in the link above that the Angels ‘guard the threshold’. They convey our prayers to God, and they bring us His answers. From this I gather that they tread the paths of Light between the Stars, and from our Solar System wend their way to the multidimensional planes of the Central Sun; thence back again to us. This entry was posted in Angelic realm, Christianity, Devas - nature spirits - nature elementals, Plane of Forces: electricity - gravity - magnetism - fohat - prana - kundalini, Prayers - blessings - mantras - affirmations - white magic, Prayers by Alice and tagged 2u3d, Angelic realm, angels, archangels, Astral beings (see also 'Demonic realm'), astral realm, Cherubim, Chris Zabriskie, Christ, Christianity, devas, Dirk Gillabel, Dominions, House of the Sun, Joska Soos, Plane of Forces, Potentates, Powers, prayers, Prayers by Alice, Principalities, Seraphim, Thrones, Virtues on 11 January 2015 by Alice B. Clagett.